A full passenger plane was quarantined in Moscow’s Sheremetyevo airport for about 4 hours, after pilots told the ground staff one of the travelers was suffering from suspected Ebola symptoms. 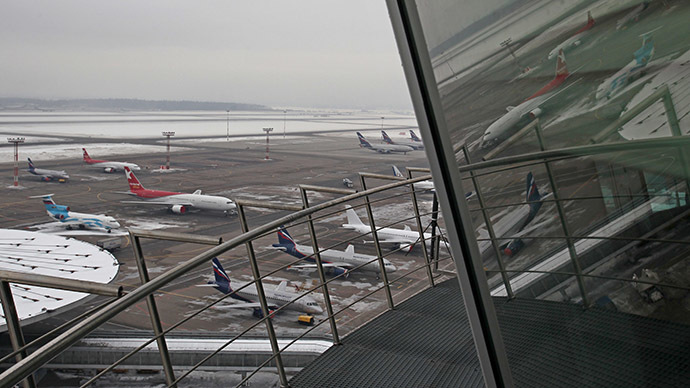 “Several minutes before landing we received an alert from the pilots about a passenger, and after being put in quarantine, she was looked at by doctors from several departments in accordance with a special protocol,” Anna Zakharenkova, the Sheremetyevo press officer said to RT by phone. After completing their examination, Medics from Russia's health watchdog Rospotrebnadzor said the patient was suffering from acute respiratory infection. The traveler and her husband, who were both transiting through Moscow, have been given a temporary visa to receive treatment at a specialized clinic in the city. The female passenger suspected of having been infected with the Ebola virus, who was traveling on a flight from Paris to Moscow, “has shown no specific symptoms” Oleg Salagaev, Russia Health ministry spokesman said, as cited as cited by Russia’s RIA Novosti. She has been sent to hospital with a “viral infection” diagnosis for a more in-depth examination, he added. “The chances that the patient’s symptoms have been caused by the Ebola virus are extremely low,” Salagaev stressed. However, he said that the Russian medics have been performing all necessary sanitary and epidemiological measures in connection with the incident. Passengers had complained about being left in the dark about their risk and prospects, as they sat on the plane for nearly four hours. They have now been allowed to go through passport control. Russian carrier Aeroflot, which operated Flight 2455 between the French capital and Moscow, says there was never any evidence the female passenger was suffering from the deadly African virus. Maksim Fetisov, the Aeroflot press secretary told RT said that insofar as the company knew, she had not even visited any of the African hotbeds of the disease in recent months. The head of Russia’s public health watchdog, Anna Popova, told Interfax at the beginning of December that more than 40 people had been tested for Ebola in the country since the outbreak of the disease over a year ago, and not a single case had been confirmed. The World Health Organization announced on Monday that more than 8,500 people have died during the worst-ever epidemic of the west African virus.